The beer and wine world is full of awards, brewing titles, and gold medallions. So much so that it is hard for any one accolade to stand out. That’s why, to launch Monteith’s latest brew, Patriot American Pale Ale, the brewery and Colenso BBDO chose to go after the only piece of recognition that should matter to an American Pale Ale – the official U.S. seal itself. The campaign launched this week as an open request to the U.S. Embassy in Wellington, the “closest America they could find”. 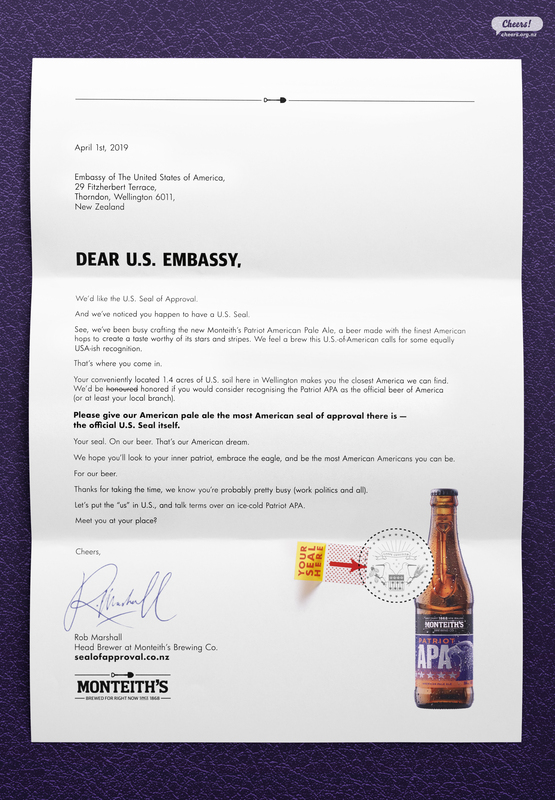 With blind optimism, requests have been made via a billboard outside the embassy, a full-page open letter in the newspaper, radio addresses, a social media campaign, and a website appeal – all of which were personally addressed to the U.S. Embassy in the hopes of getting approval to use the seal on the beer. And apparently there’s more to come. Dan Wright, ECD at Colenso BBDO, commented “It’s a seriously American Pale Ale,” whilst wearing nothing but an Uncle Sam hat and matching speedos. America could not be contacted for comment at the time of writing. Why are we being sycophantic to the US Embassy? Is this irony? Help. I don’t get this.